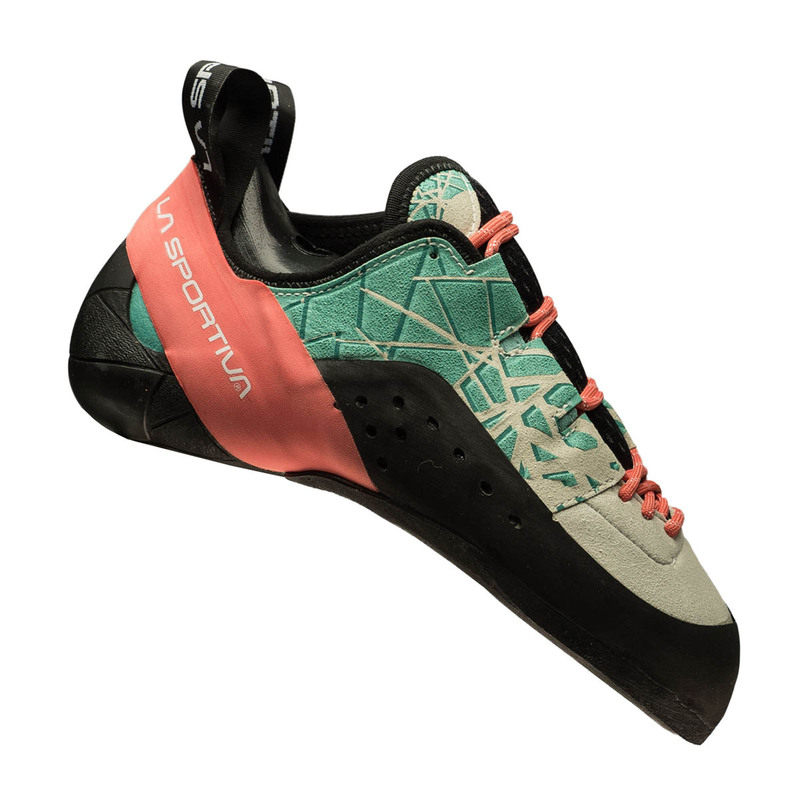 The La Sportiva Kataki Women's is an all-round outdoor crag shoe designed for the perfect balance of technical steep performance and edging power. A blend of two of La Sportiva's most popular shoes, the Otaki and the Katana Lace, the Kataki utilises the versatile downturned front section of the Katana and the performance S-Heel™ of the Otaki, making it perfect for long, varied climbs with both overhanging and vertical sections. This women's version uses XS Grip 2 rubber designed for maximum friction, so expect it to perform slightly better on overhanging routes than the men's. 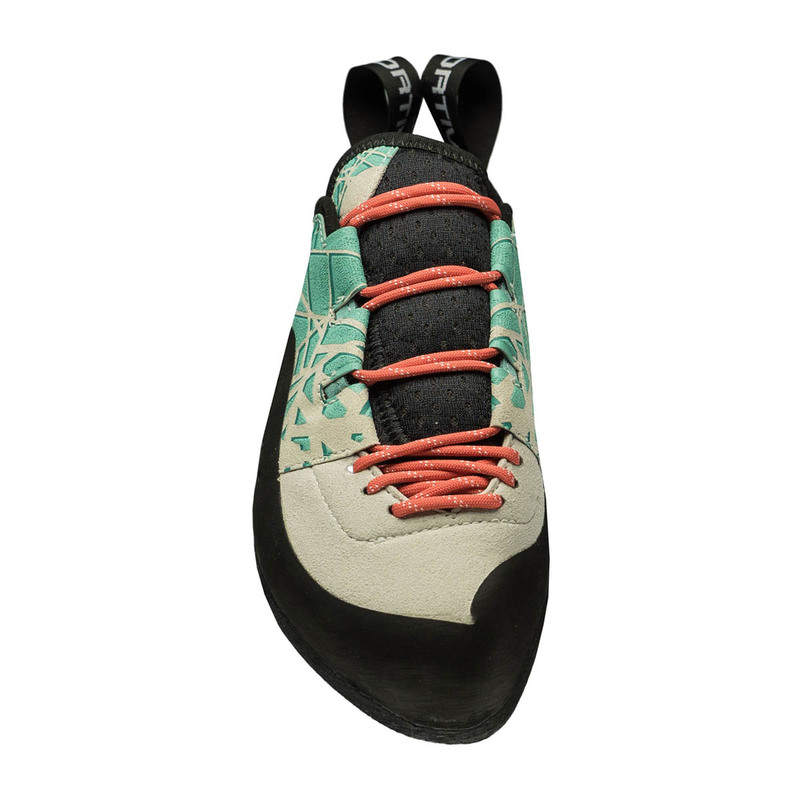 The Kataki Women's features two of La Sportiva's signature technologies. The first is the P3® Rand System, designed to add extra structural support to the shoe to ensure it doesn't lose its shape over time, as non-synthetic climbing shoes tend to do. 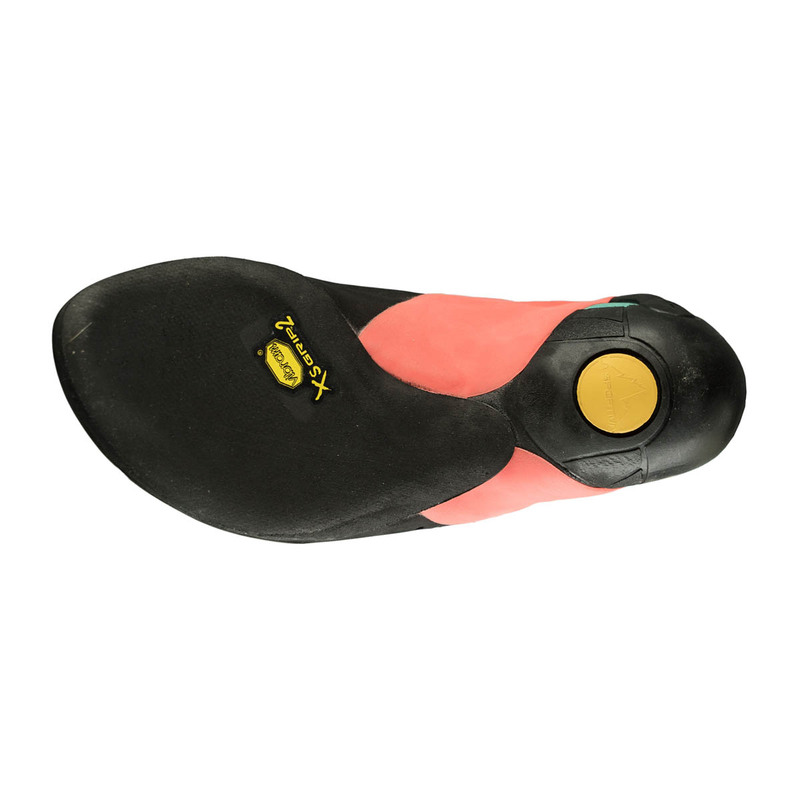 The second is the S-Heel™, a rubber shell that encapsulates the heel containing an incompressible piece of rubber, which prevents the shoe's rubber from deforming when hooked or blocked - that means a loss of power. The Kataki Womens' upper is suede leather / synthetic with linings at the front and back. Expect there to be up to a half size of stretch, and size appropriately. La Sportiva recommend you wear this shoe on the loose side for a comfort-performance fit. 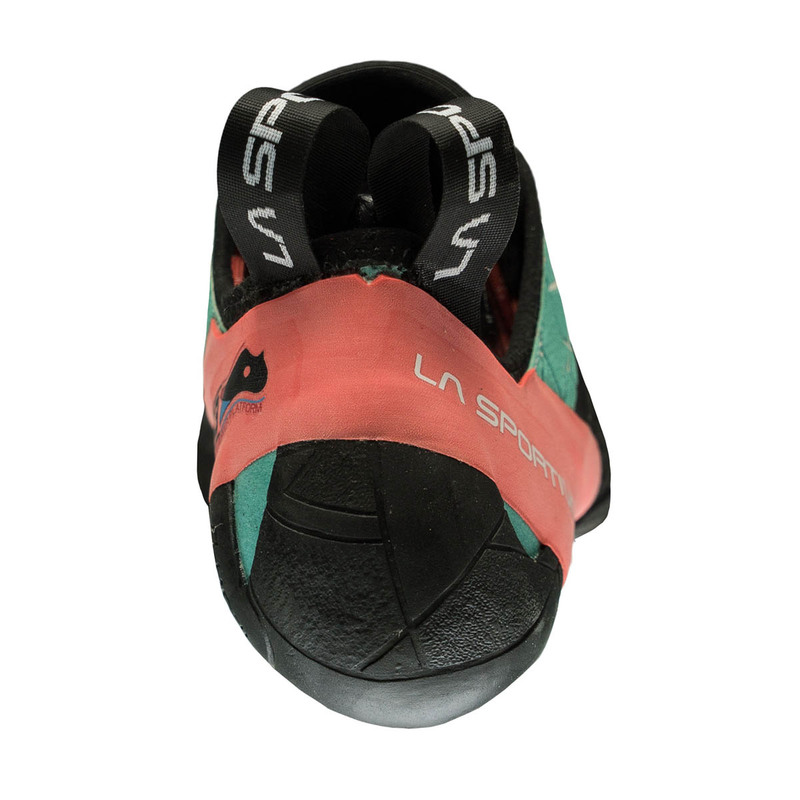 An incompressible piece of rubber is placed on the inside of the shoe’s heel cup. This prevents loss of power during heel hooks and blocks by prohibiting deformation of the heel rubber on the hold and heel torsion inside the shoe. Wore them once for 3 hours and ended up with a swollen Achilles, so I stopped climbing; next day it was visibly twice the size. -climbed and stuck a 21 I had one move I kept slipping in my old shoes. -colours look good, not a fan of the yellow. -ankle/heel collar so tight and high up it left my Achilles swollen. Stopped my session and then my climbing for a few weeks. Could not even have a normal shoe on after it, anything touching my Achilles hurt. Had a scan and the tendon sheath (outter cover) was extremely irritated. Had to buy backless shoes to be able to walk. -have only worn them for 3 hours, have now got an irritated Achilles which still flares up and I can’t return them- so $215 down the drain and had to pay 100 for backless shoes. Very annoyed. None of the Aussie climbing stores are getting the women’s version of this to try on, only men’s, so had no option to try. -I wore a 39.5 in katana Velcro, which just fit me. I tighten the Velcro fully as I have a narrow and low volume foot. - reading reviews, people said to size down (I’m a street 40.5) and going by the fact la sportiva lists these as slightly higher volume on their comparison chart, I decided to go the same as I figured they would be too loose otherwise. If I had my time again, I’d of gone for the 40 instead, only half a size down- the Achilles is still not good and it’s been more then a month now. - not sure if it’s the s-heel or the more aggressive downturn that caused it. I have narrow heels so wasn’t expecting that to occur. -from my experience, I’d say only go half a size down- laces will allow you to dial in the fit. Great fit, easy to put on and break-in easily. I was looking for a pair of shoes that perform just well as Miura (lace) but would be more comfortable. Although aggressive it is a super comfortable pair of shoes. These shoes really work. For years I used the Miura VS but the heel somehow was just not perfectly fitting. These have a newly designed heel allowing them to fit the foot in a more effective way. They fit a little like the Solutions but are more sensitive in the heel. They edge like no other. Highly recommend them. These shoes are great, just great. I have changed over to them from the Katanas and I think I will find it hard to go back. These are really comfortable as far as climbing shoes go. I went with my street size. Really good fit with the laces. Great for climbing long trad routes which require some more technical climbing.really precise and will keep you on your toes. To top it off they are a beautiful looking shoe! These beauties could just be your best climbing companion after your rope partner. If you use a rope. They will keep you on your toes, even on the smalles of footholds. Precision at its best. Dancing on rocks has never had, for me, the same precision packed with comfort. The heel is a bit bulky, but apparently its my style & fit, just what I need to get close and personal with the wall while heelhooking. I also own Katanas and, while the velcro is convenient, the laces system make the shoes a better fit, more stable & precise. I chose them the same sizing and I don't think I'm going to look back after I discovered Kataki. While these beauties don't know how to climb by themselves, I have this feeling that together we can climb more and better. Cause' this is the beginning of a beautiful friendhip! Oh, did I mention the delicious colors? Comfortable and precise. And they also look nice. It's a pleasure to climb in them. I could not yet find them a weak spot.